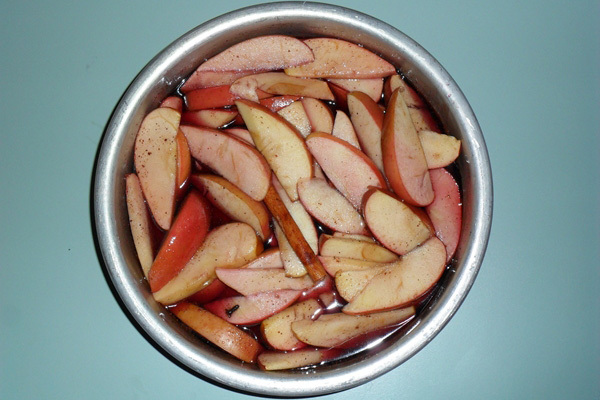 Apples in Sweet Red Wine Sauce. Photo Credit Michele Frank. Preheat the oven to 350˚. Line the sides of a large baking pan with butter. Slice the apples into medium-width pieces, leaving the skin on. Put them directly into the metal pan. In a medium size bowl combine the sugar, nutmeg, and red wine. Whisk well and pour onto the apples. Place the cinnamon stick on top and tuck the cloves into the apples. Cover with foil and bake for 30 minutes. Once the apples are out of the oven, remove the foil. Let the dish cool for approximately 10-15 minutes. Serve with sauce from the pan and top with whipped cream. Bio: Michele is a senior at Penn State majoring in print journalism. She loves to cook for her friends and family, and wishes to make a career out of her hobby. She spent last summer working for Gulfshore Life Magazine in Naples, Fla.
That looks like a great dessert I should make it sometime because I have always to tried different apple recipes with all the apples we are getting this fall. Does it go well with ice cream?